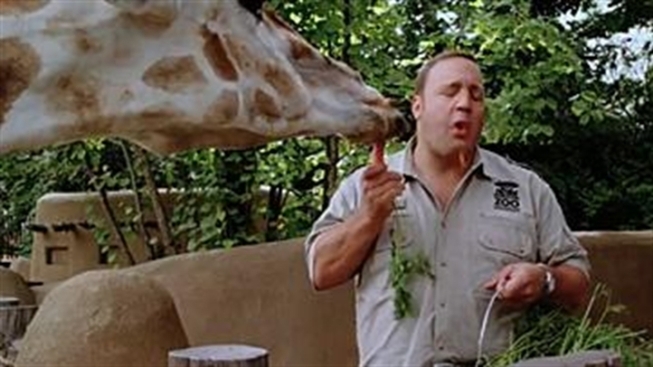 About the only thing you might count as unexpected in "Zookeeper," the latest tired Kevin James vehicle, is something the film actually doesn't do. Though it hardly suffers from a dearth of other inept slapstick comedy bits, at no time does James get hit directly in the groin by anything. Instead, its nearly mirthless two hours are filled with scenes of James getting knocked in the head, whipped with a plastic flag pole and getting thrown over a wall by a gorilla. And yet, no matter how many times he hits the deck or smashes his face into something concrete, it still never feels like he's suffering enough for putting you through this dreck. James plays a zookeeper named Griffin, who years earlier was badly dumped by his girlfriend, Stephanie (Leslie Bibb). When she suddenly returns, on the eve of his brother's nuptials, Griffin goes into a frenzy to try and win her back from her lumpish boyfriend, Gale (an absolutely brutal Joe Rogan, who can't even play himself convincingly). The gimmick is the zoo animals all want to help him win her back, and break the animal code of not speaking in front of humans in order to relay their advice. Predictably, many of the animals are voiced by recognizable, big name actors, who want to emulate their public personas: Thus, Nick Nolte does the voice of the wounded and lonely mountain gorilla, Bernie; Sly Stallone is the voice of the lion; Cher, his lioness; Faizon Love plays one of the bears, alongside pal Jon Favreau; Don Rickles is a frog; and Adam Sandler is the little monkey whose advice involves "throwing poop" at everyone. Quelle appropriée! By the end, of course, the film has to make some shabby attempt at being "about something," the way Sandler-related comedies always have to pretend to have a subtext in order to justify their running length. In this case, we are meant to believe that Griffin has learned that its more important to be himself, conveniently falling in love with a stunningly gorgeous zoo veterinarian (Rosario Dawson) in the process, then fall prey to the goldbricking love of a gorgeous, but fickle, woman. The script, which initially sold for a whopping $2-$3 million before going through the rewrite meat grinder with a veritable who's who of humorless drones, including Nick Bakay and James himself, goes through its dimwitted paces without much sense or sensibility. Complaining about the manner in which another zookeeper abuses his charges when no one else is around, Bernie complains that all humans are the same, "They lie." Yes, and they make terrible movies, too.